This home has something for everyone. The pool and hot tub were a hit with the kids and parents, while the family/game room was quiet with plenty of seating so the older adults could talk and visit without the noise of tv and kids. The kitchen had everything we needed to prepare healthy meals and the bedrooms were roomy and beautiful. The yard was so big! We were able to toss footballs around and play outdoor games. This was the nicest vrbo home any of our family booked through vrbo in the San Diego area. There were 11 of us staying in the house and we all felt like we had plenty of space. Definitely booking again if we come back!! Greg was great to work with and very encouraging when he knew I was on the fence about the cost and renting sight unseen. Well the host did give a very descriptive layout of the house and it was right on with each point. Location was great, close by restaurants and shops which was key. House is amazing, very spacious for a family of 8 without feeling squished. I would definitely stay again without a doubt!! Thanks Greg. We enjoyed meeting Greg and really appreciated the wine and the excellent local recommendations he gave us. This condo is extremely comfortable and spacious and the view is killer. We loved that we could leave the sliders open all night and hear the waves. The location is excellent, so many dining and drinking options within walking distance. We enjoyed meeting the property manager and appreciated his excellent recommendations. We would definitely stay here again and recommend it to others. We loved out stay at Capri By the Sea #612! It was just as wonderful as described with the best views and amenities. The unit was so clean, down to the sponge in the sink and the linens. There were ample toiletries - more than your usual rental - with laundry soap, dishwasher soap as an added plus! We were able to completely relax in this wonderful unit. Everything is within walking distance and we didn't even drive until we (sadly) had to leave. Greg was responsive and prompt to meet us to check in. We appreciated the personal tour of the property and orientation to our surroundings. We will certainly stay here again. I did not work with anyone from your team except for Greg. It was a fine experience. Wonderful location and comfy, well-stocked home. Highly-recommend!Walk to the beach and restaurants or just stay at home, it has everything! Very knowledgable and friendly staff. Very easy to work with. This was the second time we stayed at the Capri and it never disappoints! Beautiful property, amazing views and the location is perfect!! Walking distance to local bars and restaurants and easy access to the beach!! Fantastic place to stay and we will be back next summer!!! Greg helped me all the way! I was a bit of a pest, due to almost falling for a scam. So i was a bit gun shy. Greg kept giving me the info I needed. I really appreciate it! It was unseasonable hot in San Diego, Greg called and let me know he was having windows open to help with air movement. How nice is that!! The property was perfect. The owner has everything needed. Pacific coast sent messages to keep me informed, reassured me about my choice. Half a block from the beach and amazingly comfortable. We will be back to this property and will always search Pacific Coast first for our vacation needs. Already telling friends!!! The staff at Pacific Coast Vacation Properties were great to work with. Angelina was easy to contact and very friendly! The entire staff were professional, yet personable! Our family shared this home with 2 other families while we were all in town for our boys World Series Baseball Tournament! The house was well laid out, with room for everyone. The boys loved the pool table room, which they took over! We had relaxing evenings around the pool BBQing and enjoying a cocktail! The location of the house was perfect! All shopping and restaurants were very close and easy to access. We all felt at home in this property. The kitchen was well stocked with every utensil we needed! We enjoyed preparing gourmet meals, and sitting around the table playing card games. If we ever find ourselves vacationing in the San Diego area again, we would rent this property again! It was obvious that Greg is very involved personally and takes pride in his business to make certain his renters have a good experience. Since our flight arrived several hours prior to check in time, we were very pleased that we were allowed to stop by and drop off our luggage while the cleaning crew was there. The property was just as advertised, if not better. The photos of the property depicted it perfectly so that there were no unpleasant surprises when we arrived. Everything was excellent, from the ease of booking, to the rental itself. We couldn't have asked for a better trip, and a large majority of that was the property, the amenities, and the ease of booking, ticket purchase, and the lack of worry! Thank you for making this such a wonderful and stress-free trip! The property was absolutely wonderful, from the feel and decor, to the location, to the amenities... it really could not have been better! We will definitely be back! Your team was amazing. Mike was amazing, helpful, nice, patient, easy to talk too and available. I did have a problem initially in making my reservation over the Fourth of July weekend where the website first allowed me to book a 4-day stay when the owner apparently had specified stays of 5 days. I'm assuming that has now been changed in the system. Your staff graciously helped me to make adjustments to correct my reservation. 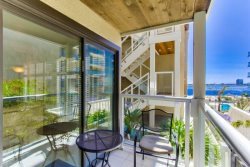 The location of this property is perfect for hitting the beach, walking the boardwalk, or driving into La Jolla. For our family, it was a return to the beaches we visited for our family vacations starting 30 years ago, this time sharing these memories with our grandchildren. Greg is very nice and easy to work with. He is great. The property is clean and the location is excellent. The property had everything we needed to have a great time. It was spacious enough for 2 families to enjoy. We can't wait to come again. Beautiful property! Great for family vacation's. The property was perfect! Loved all the amenities offered and the way it was all marked for ease of finding anything we needed. The owner reaching out to welcome us was special. It was nice to have that direct contact, above and beyond the Pacific Coast Vacation office, just in case of questions. Thank you! After being in the hospitality business for over 25 years, I was most impressed with the entire process. It was easy to confirm on online, all the followup information sent to us and the beautiful property represented was fabulous. We will certainly use your services again. Thank you! I spoke with Greg and a staff member before arriving. I received and email from the owner before arriving. All communications were quick, efficient, clearly articulated and polite. I felt very at ease and confident that everything would go smoothly. I was pleasantly surprised that it was even easier than I expected. Staying at Michael's home was like visiting an easy going friend. His house was laid out well all on one level and not too spread out. With a limit of 6 adults, there is plenty of space. We were a party of 4 so we only shared with only one other person. The back yard patio was an extension of the kitchen for extra dining space. The yard was totally enclosed by a high vine covered fence with grassy area for children to play. I watched the humming birds flit around the plants and bushes every morning. It is a lovely quiet and safe neighborhood with the elementary school directly across the street. Angelina was extremely helpful in making sure we received all of our documents as we progressed through the booking, contract and final payment process. She provided alternative phone numbers in the event that we could not reach anyone in the office, and was instrumental in arranging a visit to the property by the manager to address some minor issues with electronics and a couple of other things. She called us soon after our arrival to welcome us to the home and offer her assistance if needed during our stay. Greg was also very helpful and courteous when he responded out to the house to troubleshoot the electronics, lighting, etc, which we really appreciated. We hope to return to Mt. Helix again sometime. Many thanks. All good except for the local contact provided. Loved the house and the yard was great for small children staying with us. The bedrooms were a nice size, comfortable and quiet. Plenty of room for our wedding party to get ready and for family activities. When we needed a quick reply to info on how to find the property, you got back to us before we were leaving on the trip. I gave you only a day to do this. Especially enjoyed the out door patio for relaxing in the evening after a long day of activity. Our experience with Pacific Coast Vacation rentals was wonderful. The booking process was easy and all of our inquires were addressed quickly. The home we rented far exceeded our expectations. The property was beautifully maintained and stocked with everything one could possibly need to have a wonderful vacation from boogey boards and bikes to towels and beach blankets, not to mention a kitchen and grilling area complete with plenty of kitchenware and utensils. We had an amazing experience and can't wait to book our next trip with Pacific Coast ! Michael was friendly and responsive. Check in was easier than a hotel. Quiet neighborhood and close to everything we needed. We had a good experience booking and met Mike the day after we got there. He was very friendly and helpful! We thoroughly enjoyed our stay at your home.....it was very peaceful and restful for us. We appreciated the quick access to the highway, the beach, and Starbucks, and enjoyed having a place we could hang out and eat as a family. I called several times because of issues with my payment and everyone I spoke to was very helpful. Great customer service! It was my first time renting a vacation home and I will probably never stay in a hotel again! We had a group of 6 women and we absolutely enjoyed this house. There was plenty of space for all of us (we all overpack). We felt right at home! We enjoyed the area and the amenities. Thank you for your hospitality! The staff was helpful as I confirmed the details a few times. One of the best vacations I have had in long time... the house was perfect the nearby amenities, the biking on the boardwalk and the beautiful ocean. The trip was a relaxing and worry free stay! LOVED IT!!!! Clean, 1 block from the ocean, great location, can't wait to go back. Best experience we have ever had at a vacation rental. Management team were incredible nice and made sure we had everything we needed. The home has every amenity you could imagine and is CLEAN!!! Amazing clean. Close to the beach, restaurants, and shops in a very quaint neighborhood. You will love it here! very helpful and easy to reach. great!! Very professional from start to finish...very pleased!! We love the location. Last year we stayed in a 1 bedroom/1 bath unit. This year we brought some lifelong friends and stayed in a 2 bedroom/2 bath unit. Both times were great. Truthfully, I don't want you to read this since I don't want you snatching up my new favorite destination. Seriously, it was a great stay. Everyone got back to me in a timely manner. Someone had a difficult time finding my signed contract that I e signed on my phone. The location of the condo was excellent. In walking distance of the beach, restaurants and shops. The patio had a great view of the ocean.